The Royal Opera in Stockholm made a connection between the opera house and the everyday life of Stockholm commuters with an online “Emotion Planner” (Kansloplaneraren). Working with DDB Stockholm the company replaced every subway station in the Stockholm subway with an emotion, each with its own designated piece of opera or ballet music. 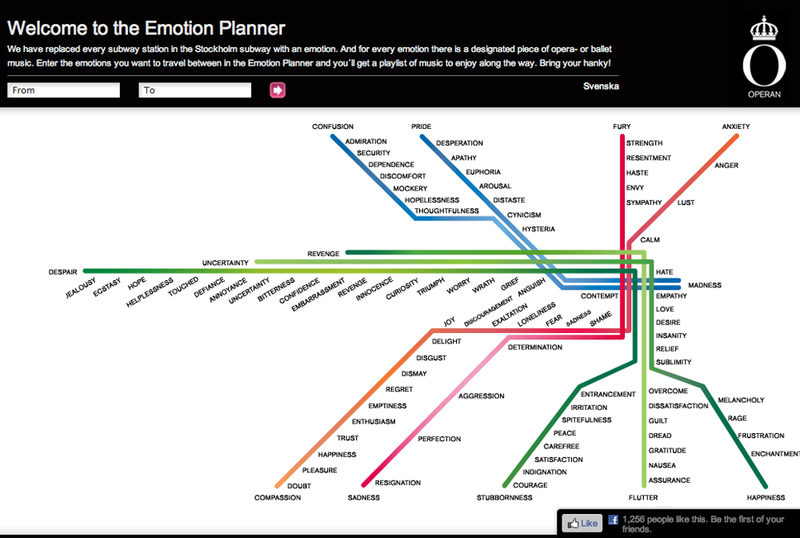 Site users were invited to enter the emotions they wanted to travel between in the Emotion Planner, resulting in a playlist of music to enjoy along the way. The campaign has won a gold web award at the 2010 Epica Awards. The Emotion Planner campaign was developed at DDB Stockholm by creative director Andreas Dahlqvist, copywriter Olle Langseth, art director Tove Langseth, account director Niclas Melin, planner Karl Wikström, web producer Linda Eriksson, account manager Lina Svensson, designer Calle Reimers, web designer Josefin Frisenfeld, technical director Pontus Kindblad, and producer Anna Hellenborg.